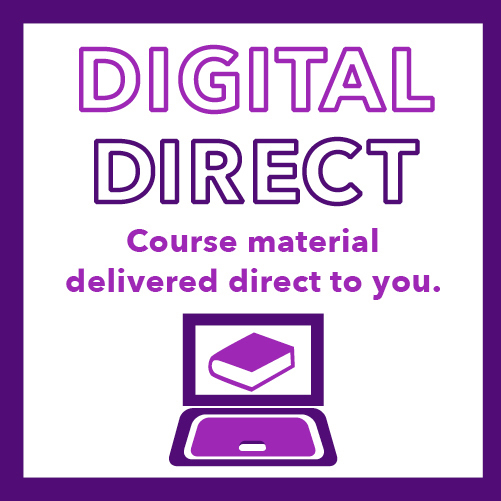 Digital Direct converts physical course materials into instantly accessible, totally interactive and adaptive digital content, while drastically reducing the cost to students. The goals of this initiative are to (1) provide students with more affordable course materials, (2) improve educational outcomes for students and enhance the student experience on a common digital platform via Canvas, and (3) position The University of St. Thomas to be ahead of the curve with digital content. Students should be sent an email, by the professor, two weeks before classes begin with instructions on how to access their digital course material content. Access to the content is through Canvas and available by the first day of class. Students enjoy free access to the content during the first two weeks of class. After the free two weeks, to retain access a student does nothing! A charge is conveniently billed to the student’s university account. If a student chooses to opt out of the program, they can do so easily by clicking here to see the opt out power point and access will be turned off and no charge assessed. Keep in mind that by opting out, you may be losing access to material critical to your success in class. 1. What is Digital Direct? The Digital Direct program is a new textbook model in collaboration with publishers that converts books into digital content. All students enrolled in a class purchase the content, lowering the cost for everyone. All students in that class also get access to the content on the first day of class and won’t be billed for it until after the tenth day of class. The digital content also includes Interactive Learning Platforms. 2. What is an Interactive or Adaptive Learning Platform? Interactive Learning Platforms are much more than e-books. They are interactive software platforms developed to provide an enhanced learning experience beyond reading the text. They may include multi-media video and audio presentations, adaptive quizzes and homework which link directly to the text. They also allow for various levels of customization by the instructor and peer-to-peer sharing of notes. 3. How much does Digital Direct cost? The price varies depending upon the course materials chosen by the instructor, but Digital Direct is priced below market price. 4. How will I get my access code? If your instructor is using Digital Direct, you are already enrolled. You should be notified via email prior to the start of class with access instructions, the discounted pricing and information on opting out. 5.How do I pay for my access? The access is free for the first 10 days of the course. After 10 days, all enrolled students who have not opted out of the program or dropped the course will have the discounted price billed to their student account. No waiting in line with a heavy, expensive book! 6. What does it mean to opt-out? 7. I opted out by mistake and realized that I still need my access. Can I opt back in? Yes. Simply email the Campus Store at bookstore@stthomas.edu to request that your access be reinstated. 8. I did not opt out, but I did not register my access or use the online platform. Will I still be billed? Yes. All students who are enrolled in a course using Digital Direct are automatically considered part of the program. To avoid being billed you must opt out online during the first 2 weeks of class. 9. I dropped the course. Do I still need to opt out? Students who drop the course during the first 10 days of class will automatically be “opted out” and will not be billed. Students who drop after the tenth day will have five days to notify the Campus Stores at bookstore@stthomas.edu to request a refund. 10. I forgot to opt out and missed the deadline. Can I get a refund now? Once billing has been completed, the only option for a retroactive refund is with withdrawal documentation. Please email the Campus Stores at bookstore@stthomas.edu with documentation to request a refund. 11. Who should I contact if I am having trouble with access to the online content? If you are having trouble, contact help@redeshelf.com for help. 12. I already have access to the online platform from a previous course. Can I continue without paying twice? 13. I added the class late. Do I still have 10 days before being billed? Billing begins on the 11th day of class. If you added the class on the ninth day or later, you will have 48 hours (two days) to decide whether to opt out before being billed. 14. I didn’t get an email about my course, but other students in my class did. Was I sent an email? All enrolled and wait-listed students are emailed about the program. If it is not in a spam folder or was accidentally deleted, email the Campus Store at bookstore@stthomas.edu for access instructions. 15. I have further questions that were not addressed. Who do I contact? If your question wasn’t answered in the FAQ, please email bookstore@stthomas.edu for more information. 16.How do I opt out?